Click on the song titles to to preview "Josephine" & "When I'm Gone"
Nashville, Tenn. - May 29th, 2012. In signing up for CMT’s competition show Can You Duet in 2008, Rory Feek wanted one thing: for the world to know his wife Joey, and the power of her voice. “My whole hope was: I'm going to get eliminated immediately, but they might hear her sing,” he says, now four years into a career as her Joey+Rory duo partner, and a decade into life as her proud husband. The couple far surpassed his expectations, Joey+Rory taking third place and subsequently signing with Vanguard/Sugar Hill Records. Over two studio albums -- 2008’s The Life of A Song, from which single “Cheater Cheater” is culled, and 2010’s Album Number Two -- country fans have indeed come to know Joey’s crystalline belt. They’ve also come to know Joey+Rory as a couple, rooted in an 1870s Pottsville, Tenn., farmhouse, Rory writing songs and tinkering with old cars, Joey gardening or baking bread at Marcy Jo’s Mealhouse, the local restaurant she owns with sister-in-law Marcy. 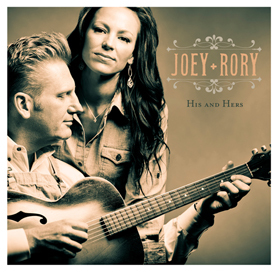 But with the new His and Hers, due out via Sugar Hill on July 31, listeners will get fully acquainted with both Joey and Rory as individually arresting lead singers, Joey taking the fore on half of the album’s tracks, Rory’s warm, approachable vocal helming the others. Along with spotlighting Joey’s graceful arcs and Rory’s homespun charm, the songs offer a thorough sonic and lyrical encapsulation of who Joey and Rory are as country artists and fans. That much is clear from opener “Josephine,” a strummy, five-plus-minute letter from a Civil War soldier, penned in heartrending detail by Rory. It stands well outside country radio’s current tendencies, but sits firmly among the country music tenets Joey and Rory individually, though similarly, came up on: strong storytelling, rustic tones, emotion-forward singing. Fans and newcomers will get to know the songs -- and Joey+Rory -- better come July, when the duo’s new weekly variety show, The Joey+Rory Show, launches on RFD-TV. Filmed entirely at their farm and in their community, its first 13 episodes will mix live performances of His and Hers tunes, recipes from their café, behind-the-scenes looks into their life together and intimate acoustic performances from the duo and a select group of singers and songwriters that inspire them. “We don't have a TV, partly because it’s hard to find good family programs to watch any more… so rather than just set at that place and complain about it, we're hoping to create some good programming everyone can enjoy,” Rory says. “Just like the records you make, you never know if this show will reach hundreds of people, or millions—either way, the journey together is extraordinary."